I have a few blooms left in the cottage gardens. The weather has switched from a very hot spell in early Sept to cooler temps with heavy marine layers, but no rain at this time. 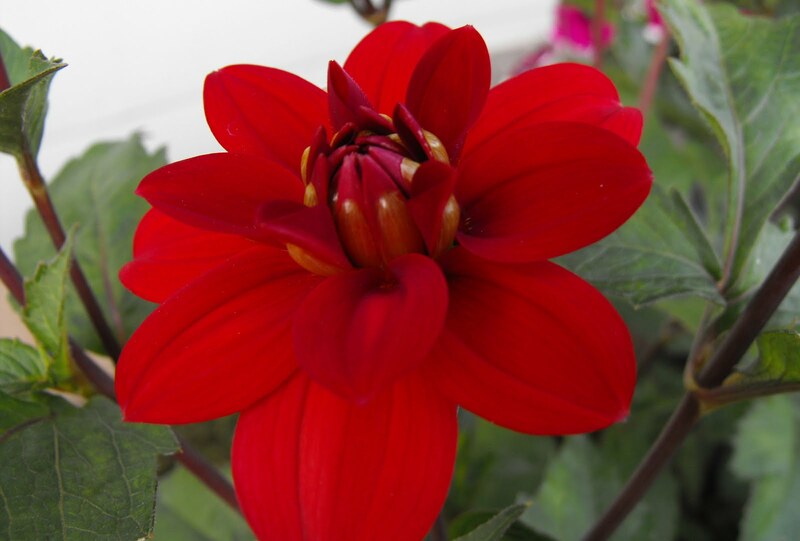 My late blooming red dahlia opened up in early September. I did not get a bloom last year due to the cool later summer and rain. She's a treat with little 4 inch blooms. Both of my other dahlia's are still going strong. 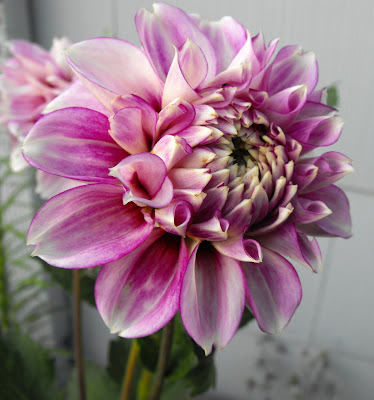 This lovely purple and white number that I purchased from the fantastic Swan Island Dahlia Farms has a delicate and soft look to it. And my favorite dahlia, and frankly, bloom in my garden, hands down. This beauty captures the colors of the setting sun. Delightful. My container pots are still going strong. I'm determined to try and overwinter my geraniums. 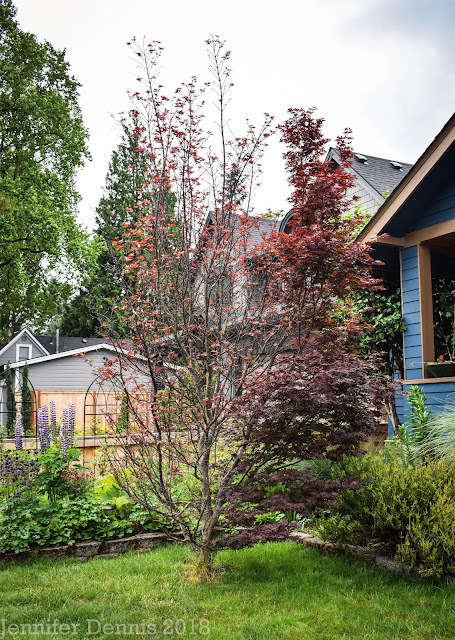 My next door neighbor who has done this says the only thing she doesn't like is that it takes longer for the overwintered plants to bloom then just running down to the box store and buying new ones each spring. 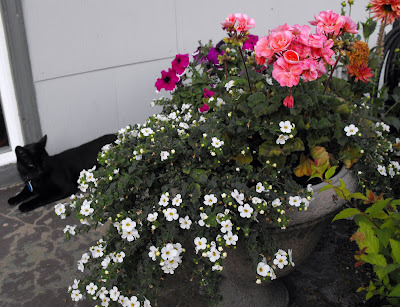 She has since stopped overwintering her geraniums. I think to be frugal, I'm going to see how it works out for me. And finally, a mommy brag moment and a last capture of my Black Eyed Susan's with my little boy on his first day of Kindergarten. I swear I only cried after the bus pulled away. Happy Garden Bloggers Bloom Day All! 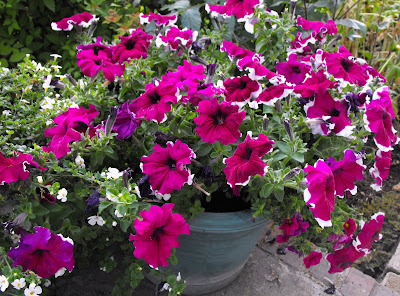 I'm heading off to Carol's to link in and enjoy the colorful blooms around the world. You could take cuttings from your geranium too and get lots more - even more frugal. I agree with Sue...you should pot it up this fall...it will get pretty tall and spindly...take cuttings and root them...you'll massively increase your quantity...they are so easy to root! Sue and Scott..Thank you, great idea, I will do just that! Beautiful dahlias and I agree on your favorite, it is a stunner. 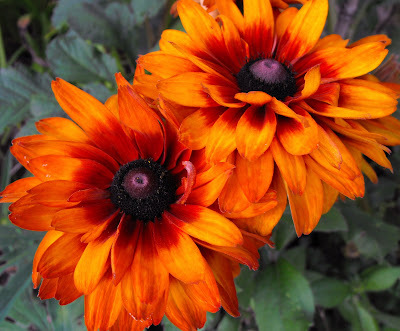 Rudbeckias are a favorite of mine, love how easy they are to grow and how much color they provide. Ah that first day of school, sigh. That Autumn Colors rudbeckia is phenomenal!! But best of all is the last pic. My daughter started kindergarten last week and we put on a brave face as she got on and then maybe had a tear or two after. Gorgeous Rudbeckia and those Dahlias are just lovely. You have trouble getting your Geraniums through your Winter, I have trouble getting them through the wet season during our Summer! I'd suggest taking cuttings too. Love the photo of your little man off into the big wide world ... he looks so happy. I'll chime in too....I've taken cuttings from geraniums for many years too - it's easy (if I can do it, it's easy!) 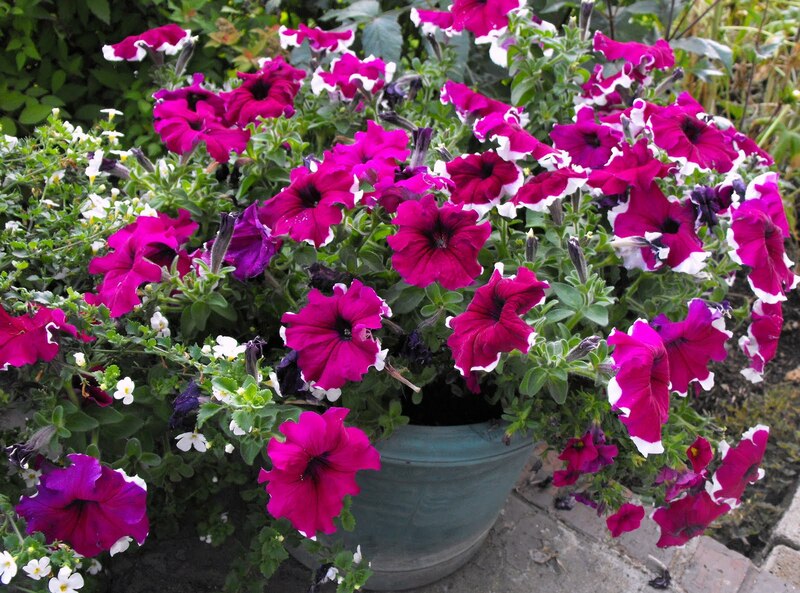 - I've been successful with both the zonal type and scented geraniums. 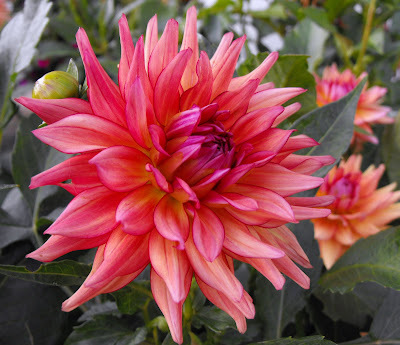 I enjoyed your dahlia photos, too. Happy GBBD. Cute kindergartener! I'm the same - I think it should be the 4th or 5th! Lovely dahlias! Happy GBBD! I love that Autumn Black eyed susan. Your little one looks so cute in front of the flowers. He looks excited. This month is just flying by, in fact I totally missed GBBD. Gorgeous Dahlias! I only had a couple come up this year of all the ones I planted. We have a neighbor that overwinters their geraniums too, they are huge! Your son is such a cutie! 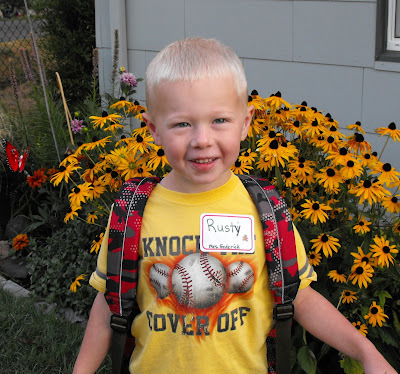 Next year my youngest will be starting Kindergarten, times just goes by so fast. Nice blooms! Very colorful. Thanks for coming by my blog also. I think you would like yarrow 'terra cotta'. all grreat blooms but the best of all is your little boy. Your dahlias are lovely - making me regret that I pulled all mine out! Are you not getting weary watering containers? But perhaps your nice rainy climate does it for you. What a milestone for your wee boy - you did well not to cry!